← Rekonstruksi, Silsilah Laksamana Cheng Ho ? Zheng He (1371-1435), or Cheng Ho, is arguably China’s most famous navigator. Starting from the beginning of the 15th Century, he traveled to the West seven times. For 28 years, he traveled more than 50,000km and visited over 30 countries, including Singapore. 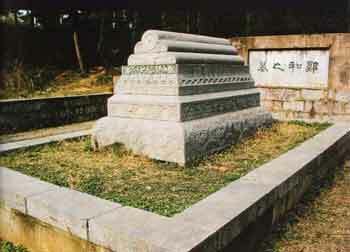 Zheng He died in the tenth year of the reign of the Ming emperor Xuande (1435) and was buried in the southern outskirts of Bull’s Head Hill (Niushou) in Nanjing. Zhenghe constructed many wooden ships, some of which are the largest in the history, in Nanjing. Three of the shipyards still exist today. Chinese literati, Cen le Cin, in Daily “Kwang Ming Re Pauw”, said, Sam Poo in 1344, on the way home, in the Indian Ocean west (Guli), fell ill and died. To keep his body, he was buried in Semarang. On the mausoleum in the city of Nan Ching (Nan Keng) on Mount Niu Soo San, Cen Le Cin, through his book Lwen Cen Hee Sia Sie Yang, published by Hay Yang Ju Pan Sie, 1985, on page 340, said, the coffin was only contains hair, a pair of shoes, and clothing (source). Pos ini dipublikasikan di history, islam, kanzunQALAM, picture, sejarah dan tag cheng ho, nanjing, zheng he. Tandai permalink.